The big news this week is that our car, which will henceforth be known as Little Red, is road-worthy! 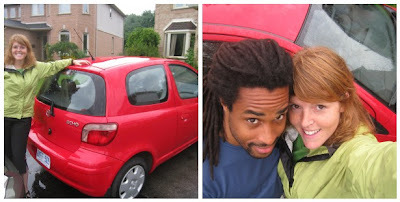 Little Red is the most basic of basic cars: a 2005 Toyota Echo two-door hatchback, standard transmission, no AC or power anything. She's very clean and very shiny, and so far her only noteworthy problem is that the passenger window doesn't roll down all the way. Next up: Quiz time! What do Juliette Lewis and I have in common? Answer: Our birthdays are both June 21, and we have both banged (or wanted to bang) Brad Pitt. And, we were both at the Starlight Social Club last Monday night. I'll leave determining which one of us was wearing a leopard-print catsuit as an exercise for the reader. And finally, please let us talk about round, or ball, sprinkles. I LOVE THEM. They are just so superior to their stick-shaped cousins. A little bit of sprinkle trivia, for the curious amongst us: Round sprinkles are called non-pareils, and stick sprinkles are called Jimmies. I want to love the Jimmies just for their name, but the round ones are so satisfyingly pretty and crunchy. And they're everywhere in Canada, including on Tim Horton's vanilla-dipped rainbow-sprinkle doughnuts, and mixed into President's Choice Sprinkle Party Cake ice cream. Delish.